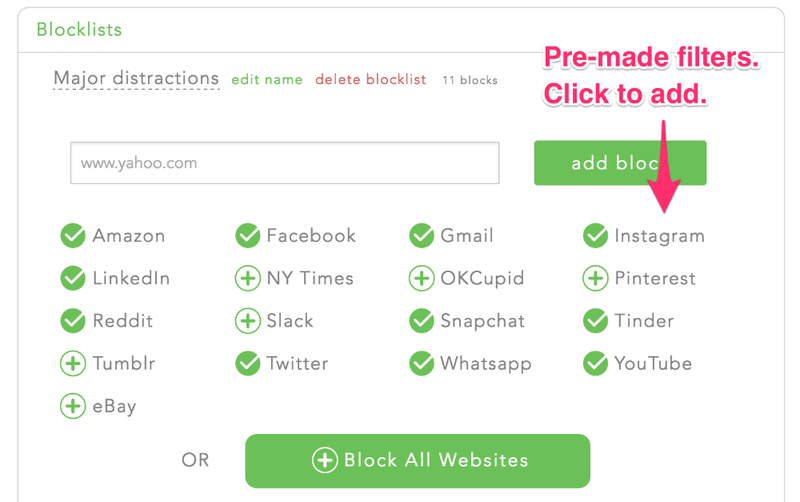 This article provides instructions on how to add URLs to your blocklists to block apps, and also provides known URLs for commonly used apps. Important note: This article refers to Freedom for iOS Version 3.0, which was removed from the App Store after Apple forbid app blocking. If you had previously downloaded Freedom Version 3.0, you can continue to use it on your devices. See this link for more information. Freedom 4.0 is currently limited by Apple to blocking websites in Safari. Issue: How do I block apps with Freedom? Freedom allows you to block more than websites - we can also block mobile apps. Blocking mobile apps is very similar to blocking a website, you just need to give Freedom the URL's specific to the app you wish to block. To block apps add the app URLs to your blocklist by typing the URLs into the text box and selecting 'add block'. We've made a list of custom URL's for commonly used apps. Important note: Our mobile service works by blocking the content coming in to apps. This can take up to 5 minutes to kick in due to caching - so make sure you run sessions lengths of 10 minutes or more. If your apps are still refreshing new data after 5 minutes, please let us know so we can help you with your blocklist! Please note, with the release of our iOS 2.0 client, it is much easier to block apps. We've tried to make this as easy as possible by adding pre-made filters for common apps. We are working to add more and appreciate your feedback on the apps you'd like to see blocked. Unfortunately these games connect directly via IP, and cannot be blocked at present. Go to the app's page in the App Store, and locate the "Developer Website" - generally the company behind the App's website. Add this website to the blocklist to see if it helps. Google "How to block [app]" - often times you'll find a discussion of how people have blocked the app on their router. If you find results, you can add the website to the blocklist. Remove the app and block the App Store. If you are not having any luck, you can always remove the App and use our "iOS App Store" block. This will prevent you from re-downloading the app while Freedom is running. Ask us! We're happy to search our database to find a hit. Send us an email at support@freedom.to or chat with us via the green chat bubble in the bottom right corner of the page. Block the iOS App Store. This blocks the Game Center which renders many games unplayable. Remove the game and block the app store. We're happy to search our database to see if there's a hit. If your Battle.net blocks are not preventing you from using the service, one of our users suggested this awesome workaround. Then, block battle.net with Freedom during the same hours you have scheduled as restricted hours. You won't be able to access Parental Controls during that time.